The second post regarding our day-trip to Washington State is a short one. Wendy introduced it to me a while back when we first went to the Chelsea Premium Outlet together. 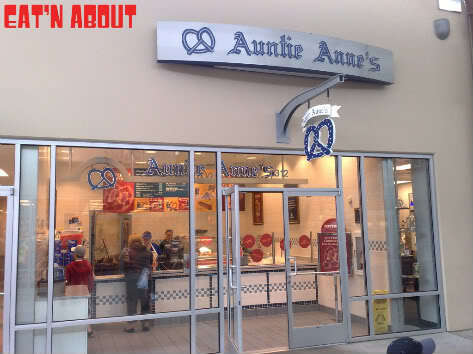 Auntie Anne’s is a great pretzel place that you will often find in many American malls. 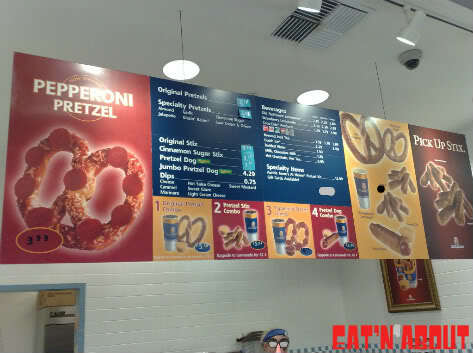 When we walked in, we were rushed by the strong aroma of … pretzels! There were different kinds of flavors available. Currently, they are promoting the Pepperoni Pretzel. I was kinda interested as I have never had it before. Wendy had a huge craving for the Almond-flavored (probably the best one), so we went with that. What’s that smell? Ah yes, freshly baked pretzels! Some of the available flavors available that we tried are Sour Cream & Onion, Jalapeno, Almond and Parmesan. 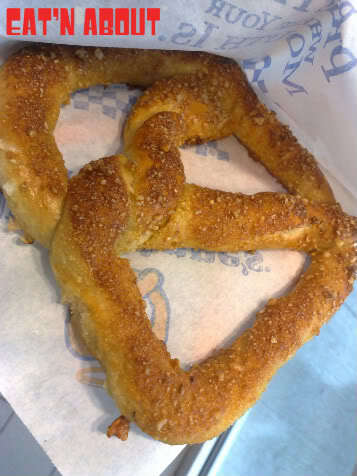 Up close and personal with the Almond Pretzel. Why we like it a lot is that it is not too sweet, the bread was soft and chewy, and the almond mix was just right. I am pretty sure most of our readers may have graced the Chelsea Premium Mall numerous times by now. Since we may be distracted by the sales of our major items (clothes and purses), we may accidentally pass by this little shop. I sincerely hope that the next time you go, try it out! Great little snack between your meals.